So, reducing the network traffic, the server to the client (browser) provides only 2 files (1 JS, 1 CSS), wich are also mutch smaller. Cache control based on the files last modified date, so we just compress it again if necessary. If necessary, then compress it and merge to 1-1 cache files. Both the JS and the CSS files are stored in order of the collection. The JS minimize its own code, the CSS minimize by an external code with CssMin 3. CssMin 3 code is original and unchanged. I would like to note I do not take responsibility for work of JCM! Of course the code is tested, but the devil never sleeps. Any known issues are published. Variable compress ratio on each files, so the already compressed files just stored on cache, and not minimized. Revisited JS adapter, slower then previous version, but it compress better. jQuery 1.62 min. code more minimze is throw a bug in the browser. jquery.js, 91572 byte, jQuery 1.6.2.min. overall: 649 ms instead of, 464 ms, this roughly 0,2 sec... Such a little css and js files while quite good (at least in my opinion). The test is not content the JCM compression time, because this is not realistic, not compressed the cache in every page load. The compression time in this case, approx. 2.3 sec. Use the JCM anytime, for free! Add to write perm. to the four newly created file, the server (apache) can be modify. Setup the correct path to jcm_main.php and the jcm_class folder. Your JS files place (relatively from index.php), and the JS cache and loader name. private $jsCacheNamePure = "united_js";		// JS cache file name, without extension! private $cssCacheNamePure = "united_css";		// CSS cache file name, without extension! 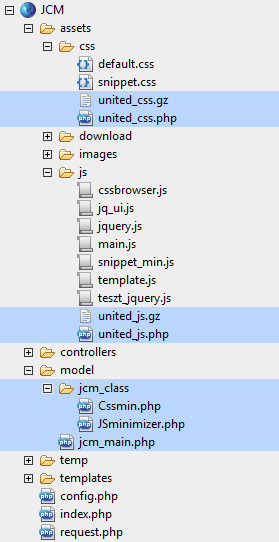 Copy the jcm_main.php and the jcm_class folder in one place, although the program can be easily configured.